Home Politics 35 Achievements by Governor Ambode in Lagos! 35 Achievements by Governor Ambode in Lagos! 1. Backlog payment of N11billion as arrears to retirees of Lagos State Government. 2. Built the Safety Arena, in Oshodi, to bring all the Departments and Agencies responsible for safety and emergency management under one roof. 3. Completed or close to completing more than 300 Local Government road projects, since 2015. 4. Repositioned Lagos State Emergency Agency, LASEMA. The Agency now operates via 4 centres, namely Command & Control Centre, Alausa, Ikeja; LASEMA Response Unit (LRU) Cappa Oshodi; LASEMA Response Unit, Lekki (by Lekki-Ikoyi Link Bridge) and LASEMA Response Unit, Onipanu. Equipped LRU with modern equipment (trucks, power bikes, heavy-duty vehicles and fire trucks, Mobile Intensive Care Ambulances and Light Rescue Equipment, and 14 new BMW Power Bikes for on-spot reconnaissance assessments of emergency incidents. 5. Launched Amnesty period for land/property owners to obtain/regularise building permits. Between March 1 and August 31, 2018, Lagos State Government will not charge any penalty for those who have erected structures on their land without a building permit. This window offers a 6-month grace period for landowners to obtain their building permit. 6. Commenced construction of 10-lane Oshodi–Murtala Muhammed Int’l Airport Road, 6. Commenced construction of 10-lane Oshodi–Murtala Muhammed Int’l Airport Road, scheduled for completion by December 2018. 7. Completed palliative repair work on section of the Lagos-Badagry Expressway between Eric Moore and Okokomaiko. Work ongoing on Okokomaiko to Badagry section. 8. Established Lagos State Consumer Protection Agency, LASCOPA in 2017, for speedy redress of consumers’ complaints. 9. Acquired equipment worth more than 5 billion Naira for the State Police Command and Rapid Response Squad. Equipment donated include 100 4-door salon cars, 55 Ford Ranger pick-ups, 10 Toyota land cruiser pick-ups, 15 BMW power bikes, 100 power bikes, Isuzu trucks, three helicopters, two gun boats, 120 power generating sets, 15 armoured personnel carriers, revolving lights, siren and public address system, vehicular radio communicators, security gadgets including bullet proof vests, helmets, handcuffs, uniforms, kits and improved insurance and death benefit schemes for officers. 10.Launched the Bus Reform Initiative, to bequeath a world class transportation system to the State. It will see the construction of new bus terminals, introduction of 5,000 new buses, and construction of 100 modern Bus Shelters across the State. Already completed Tafawa Balewa Bus Terminus and Ikeja Bus Terminus; Acquired 434 new buses for Ikorodu Bus Rapid Transit (BRT) corridor; and commenced work on Oshodi-Abule Egba BRT corridor along the Lagos-Abeokuta Expressway (13.5 kilometers; 14 bus stations; 14 pedestrian bridges). 11.Launched the Lagos To The World (#L2W) global campaign, to better market and communicate investment opportunities in the State. 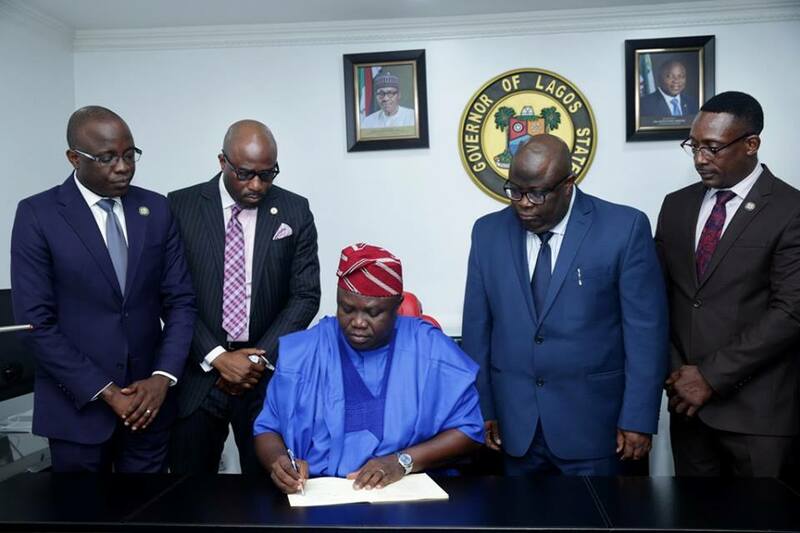 As part of the launch of L2W, the Ambode Administration has also unveiled a deal book detailing investment opportunities in key sectors including health, transportation, oil and gas, among others. 12.Employed 1300 teachers into primary education system; and Provided free medical services and psychosocial therapy to 700 survivors of domestic and sexual violence. 13.Presented 500 million Naira in Grants to 275 Community Development Associations in July 2018 to enable them complete various self-help projects. 15.Upgraded 9,174 square meter Alfred Rewane Garden, Ikoyi and opened it for use by members of the public within and around the Ikoyi axis. 16.Established N25 billion Lagos State Employment Trust Fund. The Fund has provided loans worth more than 5 billion Naira to more than 8,000 persons since inception, and helped create more than 11,000 jobs. 17.Commenced development of N49 billion Public Private Partnership Medical Park in Ikoyi, to be located at the old Nursing School along Awolowo Road, Ikoyi. (Lagos State contributing land; private investors putting up the funding). 19.Launched Ready-Set-Work, an entrepreneurial and employability training programme aimed at ensuring that every student who graduates from any tertiary institution in Lagos has knowledge, skills, and attitude required to gain employment upon graduation. More than 2,500 final year students trained since 2016. 20.Launched Lagos State Traffic Information System (LATIS), a world-class traffic information and management system comprising hundreds of cameras, road sensors and electronic displays specially designed to collect and deliver real time information to city commuters, and thus help regulate traffic. 22.Annual hosting of Lagos City Marathon, since 2016. The Marathon has placed Lagos on the global athletics map. 24.Upgraded 14 flagship Primary Healthcare Centres (PHCs); Provided 20 Mobile Care Unit ambulances and 26 Transport Ambulances across the State; Approved the establishment of three new Maternal/ Child Health Care Centres to expand the scope and reach of public health service delivery. 25.Constructed Flyover bridges for Ajah and Abule-Egba areas, and Multiple Lay-by to ease traffic congestion along the Third Mainland-Iyana-Oworo-Toll Gate Road. 26.Established Special Task Force, ‘Operation Restore Sanity On Lagos Roads,’ to clear Apapa-Oshodi Expressway of Trucks, Tankers and Trailers. Between July 20 and 22, 2018, the Task Force successfully cleared more than 2,000 Trucks from section of road between Toyota Bus Stop and Mile 2. 28.Established three new Fire Stations at Bolade-Oshodi, Ejigbo and Abesan, and upgraded facilities at the existing Fire Stations in Alausa, Ikeja, Isolo, Agege, Ilupeju, Badagry-Suru, Ikotun and Agege. Rehabilitated 225 old fire hydrants in Lagos metropolis, and installed 50 new ones connected to the mini/micro water works across the State. Also employed 250 new personnel into the Lagos State Fire Service, and purchased new fire-fighting equipment such as complete sets of Master Breathing Apparatus, Tripod Stand Rescue Equipment, Dragon Max Floodlights, Duraline Hoses, and Power Stream PPU Blower. 29.Completed Ojodu-Berger Flyover Intersection; completed 21 roads and two bridges with a combined stretch of 27.4 kilometers in Alimosho-Agbado-Oke-Odo area. 30.Established Relief Resettlement Camps in 34.Launched, in partnership with the private sector, the Cleaner Lagos Initiative (CLI), to improve waste management and processing in the State, by, among other interventions, constructing Transfer Loading Stations, Maintenance Depots, and Engineered Sanitary Landfills. 31.Established Office of Overseas Affairs and Investment to promote and coordinate investments in Lagos State, and the Small Claims Court to fast-track justice delivery in commercial disputes involving claims not exceeding N5 million. The entire period of proceedings from filing to judgment will not exceed 60 days. 32.Developed the Strategic Plan for Accelerated Agricultural Growth (SPAAG), and set aside 50,000 acres of land for agriculture in the State. The land will be allocated to farmers and investors for production of tomato, rice, fish, etc. 33.Collaborated with Kebbi State to produce LAKE (Lagos-Kebbi) Rice; and with Kano State to organize the first Lagos-Kano Economic Summit. 34.Launched, in partnership with the private sector, the Cleaner Lagos Initiative (CLI), to improve waste management and processing in the State, by, among other interventions, constructing Transfer Loading Stations, Maintenance Depots, and Engineered Sanitary Landfills. 35.Signed into law the landmark Lagos State Electric Power Sector Reform Law, to guarantee 24-hour power supply in line with Governor Ambode’s vision to attain a 24-hour economy. Also signed into law an Amended Land Use Charge Law.